What happened when a worker-owned co-op restaurant ran afoul of the Department of Labor. Casa Nueva is everything one would expect of an independent, worker-owned restaurant in a funky, progressive college town like Athens, Ohio. The walls are lined with jewelry and art for sale. Children’s drawings are tacked above tables. Its low prices, locavore philosophy, and good beer selection help it attract students, faculty, and townies. Not exactly the kind of place that would draw the attention of the Department of Labor, right? Wrong. But because of such recent scrutiny, diners at Casa are now greeted with more than a friendly hello from their hosts. Everywhere customers look—on the menus, in the window, on placards, they are reminded of Casa’s new policy, which took effect in September: No tips. What gives? Casa Nueva long ago settled on a system of pooling all tips from a given pay period and dividing them equally between all employees based on how many hours they worked that pay period. “What we truly believed in was that everybody, from the dishwasher, the prep cook, the cooks, the servers, provided the customer’s meal, so they should share in the tips,” said 25-year worker-owner Nancie Buerkel. Problem is, back in February, the Department of Labor issued “Field Assistance Bulletin No. 2012-2,” which announced that it would enforce regulations regarding what its spokesman Scott Allen called “the inaccurate use of tip credit.” The Federal Labor Standards Act lets an employer take a tip credit “toward its minimum wage obligation for tipped employees equal to the difference between the required cash wage, which must be at least $2.13, and the federal minimum wage,” which is $7.25. Allen said the department in 2011 addressed very specific information related to pay and authorized use of tips. Tip pools are legal, but a “valid tip pool may not include employees who do not customarily and regularly receive tips, such as dishwashers, cooks, chefs, and janitors”—the very employees with whom Casa servers shared their their tips. Since issuing the field bulletin, the Department of Labor has cracked down on restaurants for paying tip-earning employees less than minimum wage while they performed non-tip-earning duties, making employees turn tips over to management (which caused worker pay to fall below minimum wage), and giving tips earned by tip-earning employees to non-tip-earning employees. Even though Casa Nueva’s tip-pooling scheme was the definition of fairness, it did not adhere to the letter of the law. Casa could have paid its dishwashers and cooks $7.25 an hour and nothing more, and let servers end up much better off. Instead, as Buerkel explains, new associates all earned less than minimum wage for their hourly rate, but when the tip pool was added and then divided, they were paid “way more” than minimum wage. As a result of a Department of Labor audit that lasted several days, Casa had to change its practices. The Department of Labor does not track how many worker-owned businesses have been affected by the tip regulation, though it says it has collected more than $2.6 million in back wages in the last fiscal year for more than 600 workers who did not receive the minimum wage or proper overtime compensation. As a co-op, Casa Nueva adheres strictly to egalitarian values. Worker-owners have an equal vote at monthly company meetings, which are open to Casa’s 55-60 associates. Like most socialist paradises, it’s a bureaucratic quagmire. “We have meetings to talk about having meetings,” said Buerkel. The member handbook is a stout 67 pages. Allowing servers to keep tips was not considered an option. “There is a potential for real inequality there,” said worker-owner Matthew Paul, who has been at Casa Nueva for seven years. “We wanted to do whatever we could to keep it equitable across the board.” And while letting employees split tips on their own is legal, it was never considered at Casa Nueva. “It would have been a nightmare,” Buerkel said. Two options emerged that would allow the restaurant to follow the new labor rules: Add a service charge at the end of the meal or raise menu prices. That tipping is a voluntary act was not acknowledged. No matter what, a customer’s presumed gratuity would be added to the bill. 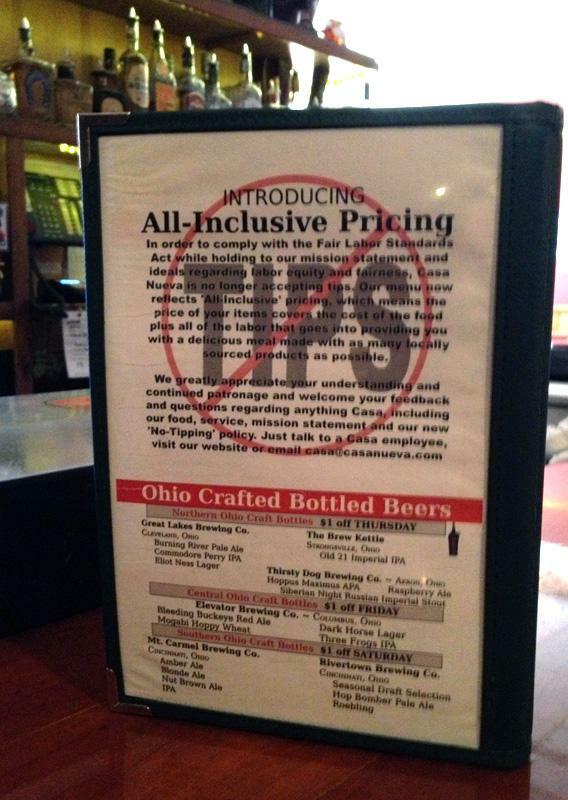 When it turned out that raising prices was easier on the restaurant’s point-of-sale computer system, the worker-owners voted unanimously (all votes must be unanimous) to raise menu prices based on previous tip averages and the cost of goods and labor expense. Now, new associates still earn less than minimum wage, but the increased revenue generated by higher prices is paid to employees as a separate “revenue wage,” which brings their compensation back to an amount similar to what they earned before the no-tips policy took effect.